Which is precisely what we’re going to discuss in today’s post. A set of revised, enforceable accessibility standards called the 2010 ADA Standards for Accessible Design outlined specific characteristics for wheelchair vans. These standards improved significantly the safety and security for passengers of adaptable mobility vehicles. Although they are not required in every vehicle, buying a handicap wheelchair van for the ADA-compliant label is an assurance of quality and safety. ADA-compliant wheelchair accessibility often prevents needless injury in an accident. These enforceable guidelines are used by the Department of Justice (DOJ) and the Department of Transportation (DOT) to outline the set of rules the public must follow with respect to places of public accommodation, commercial facilities, and state and local government facilities. They also extend to wheelchair accessible vans and vehicles for the purposes of safety and uniform design. The standards are described in various measurements, materials, and equipment locations throughout the adaptable vehicle — all elements that have been thoroughly tested by their respective manufacturers to ensure a safer, more secure ride for wheelchair-bound passengers and drivers. The ADA-compliance guidelines began as modifications to public transportation vehicles — streetcars, trains, non-emergency medical transport vans, etc. — and eventually extended to manufacturers of personal vehicles sold at dealerships throughout the United States. Keep in mind that not all wheelchair accessible vans are required to meet these design standards — only those who wish to earn the ADA-compliant designation for sale and marketing purposes. So now that we know the what and the way behind the American with Disabilities Act and the ADA Standards for Accessible Design, it’s important to know what legislation looks like when it comes to the vehicle you drive. The standards are focused on a several specific points of the handicap wheelchair van that influence the safety of disabled passengers. As you shop for your adaptable vehicle, ask your mobility dealer to show you the ADA-compliant handicap wheelchair van options that they have in their inventory. There are a few affordable makes and models of wheelchair accessible vans that boast ADA-compliance — both right from the manufacturing line and after an accessibility conversion. These examples are a good place to start if ADA compliance is something you think might fit your particular needs. 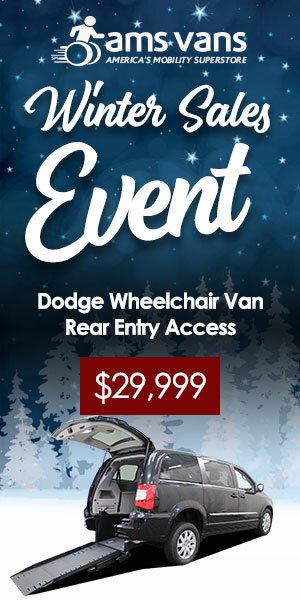 AMS Vans offers a wide selection of ADA-compliant handicap wheelchair van options. If compliance is important to you and your family, we’ll make sure that your new or used van meets the ADA’s most stringent requirements for safety and quality. This entry was posted in Disability Law, In the News, Opinion and Discussion, Technology, Wheelchair Accessibility, Wheelchair Accessibility Laws, Wheelchair Accessible Vans on August 22, 2017 by AMSVans.